With Mediterranean influences, this design boasts custom-styled features and amenities with a modern floorplan. Stucco combines with a tiled hip roof for a sophisticated facade. The courtyard makes an impression on family and friends. Tray ceilings highlight the study and dining room, while exposed beams top the great room. Fireplaces add elegance to the study and great room as well as the master suite's private patio. The kitchen features a central island with a breakfast bar that's perfect for quick meals and conversation. Each bedroom has its own private bath and double doors leading into the rooms. 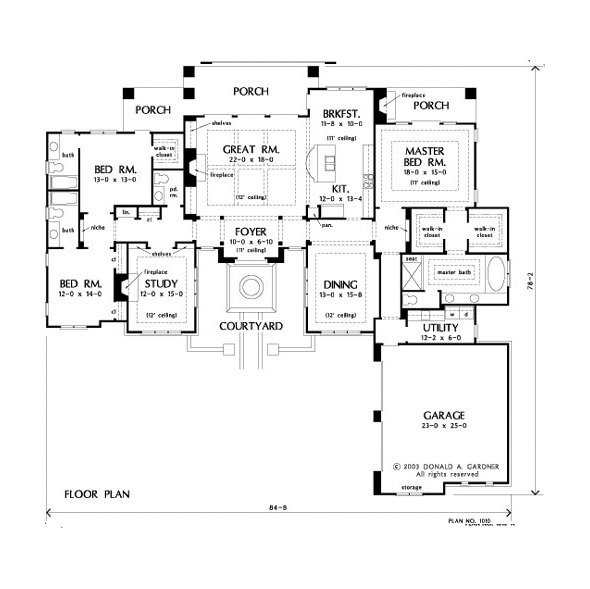 The master suite and a secondary bedroom have French doors that lead to patios. Note the built-in cabinetry, pantry, utility room and accessible powder room. 1st Floor: 2911 Sq. 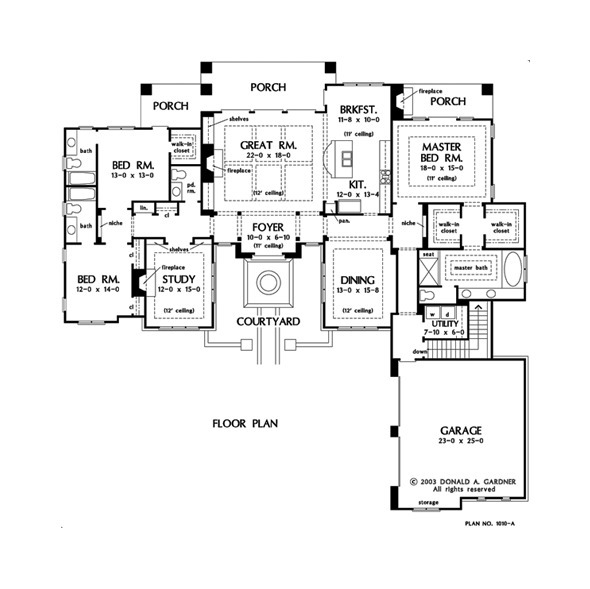 Ft.
House Dimensions: 84' 8" x 78' 2"
Foyer : 10' 0" x 6' 10" x 11' 0"
Dining Room (Other): 13' 0" x 15' 8" x 12' 0"
Other : 19' 4" x 15' 6" x 0' 0"
Great Room (Other): 22' 0" x 18' 0" x 12' 0"
Kitchen : 12' 0" x 13' 4" x 11' 0"
Breakfast Room : 11' 8" x 10' 0" x 11' 0"
Utility Room : 12' 2" x 6' 0" x 9' 0"
Master Bedroom (Other): 18' 0" x 15' 0" x 11' 0"
Bedroom #3 : 13' 0" x 13' 0" x 9' 7"
Porch - Rear : 22' 8" x 9' 0" x 11' 0"
Porch - Left : 11' 8" x 8' 0" x 11' 0"
Porch - Right : 18' 4" x 6' 4" x 11' 0"
Media Room (Other): 12' 0" x 15' 0" x 12' 0"